Thank you to Bewitched Bookworms for inviting me onto your blog to talk about my debut fantasy novel, WARD AGAINST DEATH. I’m excited to be here and I thought for today it would be fun to let my hero, Ward de’Ath, introduce himself. So, ah… a little about myself? Well, I’m Edward de’Ath the fourth, eighth generation necromancer and I’ve been studying to be a physician at the Olmech School of Health and Philosophy in the principality of Bantiana. That ah…didn’t quite turn out how I planned, so now I’m in Brawenal City in the principality of Brawenal ready to carry on the fantastic family business of necromancy. 2. What is your job and how did you come to do that? I’m a necromancer; that means I help people find closure and work to maintain the balance between life and death. I love that I can help people by giving them a chance to have a final goodbye with their loved ones. It’s a simple spell, a wake, where the recently deceased is woken for fifteen minutes. I wish it could be more, but the spell doesn’t work that way, and really, bringing someone back for longer disrupts the balance and terrible things can happen. What I really wish is to prevent the deaths in the first place, but that career option isn’t… well, it isn’t an option. Reading and studying. I love learning new things, particularly about medicine and history and languages and science and— I like to read a lot. I can’t wait until I make a name for myself as a necromancer in Brawenal. The Prince of Brawenal had one of the best libraries in the Union of Principalities before it burned down. But it’s rumored he’s been working tirelessly to restore it. Once I’m recognized as a necromancer of significance, I really hope he invites me to see his library. Maybe even ask me to suggest books to fill out his collection. A nice merlot. There’s a great vintner in West Yarbon by the Olotheal boarder who makes the most amazing wines. 5. What’s one thing most people don’t know about you? Don’t tell anyone, but I really don’t think the Goddess intended the human body to be a secret. I know it’s blasphemy, but lives can be saved. There are illnesses that people don’t have to die from. I’ve done some research (and yes, by research I mean performed necropsies) and leaned so much. I just wish it wasn’t illegal. 6. You go through some pretty big challenges in Ward Against Death. Which one would you say was the biggest? Understanding Celia. She’s absolutely amazing and beautiful and not at all like any noblewoman I’ve met. Of course, she’s also an assassin and has probably thought of killing me and disposing of my body somewhere where no one will ever find it. Yet, I see good in her. This hasn’t been an easy time for her. Everything she’s known has been turned upside down and she doesn’t know who she can trust… except for me. I think she knows she can trust me. 7. And finally, everyone’s dying to know, are you involved in a romance? No… Yes… Maybe? She’s complicated. Thanks for joining me! Today the hero of my novel WARD AGAINST DEATH chatted with us. If you could interview a fictional character who would it be and what would you ask them? I still have something for you guys! 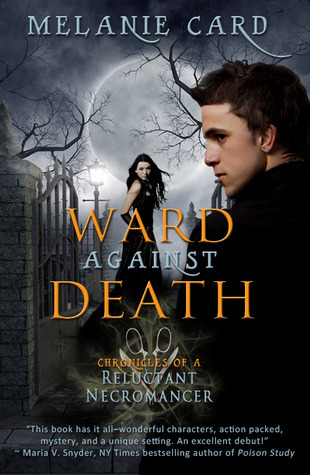 1 paperback copy of Ward Against Death! You have 24 hours (yep, 24 hrs) to enter. and answer Melanie’s question: If you could interview a fictional character who would it be and what would you ask them? Woot, that’s it my friends! I hope you enjoyed today’s post and I hope I can post my review of Ward soon! I’m in the middle for it and I realllyyy like it so far, different hero, very funny! Who would I interview and what would I ask? I would love to interview Harry Potter and ask him if he regretted anything in his journey. Of course part of me wants to interview Cat and Bones from Jeaniene Frost's night huntress series on how to keep the spark alive in relationships (since theirs seems so steamy). If I could interview any fictional character? I'd probably interview Firesong k'Treva and ask him if he knows what "humility" means. :p Seriously, though, it's hard to answer that question. There are so many characters and so many questions I'd love to ask them, stupid things like, "What's your favourite food?" to more serious things like, "What's it like to live the kind of life you do, and do you ever regret it?" I think I'd have to make an entire list! Anne: Great choices and great questions. I've been wondering if Harry regretted anything about his journey, too. Some good people died in his defense. That's a pretty heavy weight to carry. 🙂 I haven't read that name in ages! I may have to go back to my Mercedes Lackey books and have a read-a-thon. lol. Whoever blinks first must kiss. I like your interview technique. Ah, a nice merlot… good taste! Great interview, Ward and Melanie! Ward, you sound like a fascinating guy. 🙂 Gosh, I wish I could think of just one fictional character I'd like to interview, but there are so many intriguing ones. Congrats, Melanie, on your debut book. It sounds like a winner to me. As far as who I would interview, hm..right now I'm thinking Reth from Paranormalcy/Supernaturally because I need to know more about the prophecy and all of the things he's being cagey about. But I think it would end up being more like an interrogation because Reth isn't particularly forthcoming and I'd probably need to borrow Evie's taser to help move things along. I'm so loving Ward! Great interview. I would love to interview Acherson. What would I ask!? I would probably just sit there and stare… Someone else mentioned Harry, that would be cool too or Edward. Cat and Bones…. there are so many!!!! Thanks, Shea. Great interview question… I wonder what Ward's answer would be? Ah Cate, now you've gone and made Ward blush. I agree, thinking of just one fictional character is hard. There are some many great ones to choose from. And girls: Your questions are awesome! I would also LOVE to interview Harry and ..*swoon* Bones too! But, I'd like interviewing him without Cat.. I mean I love Cat…but I love Bones more ! And …. a minute with Edward would be awesome too..
My recent post Ward Against Death by Melanie Card Blog Tour &amp; Giveaway! Great answer, Jus. And yeah, I know this great little chocolate shop that makes the best chocolate. I'd be curious to know why Reese Peices myself. lol, Robin. You could use Escape by Fiction's interview technique. Why just stare when you could ask for a kiss? A girl can always dream. You never know, it might not just be a fantasy. Great answer, Jenny! Nice answer, Victoria. The joy of fiction is that the answer can be anything we'd like, so I'm sure he'd say yes. Since I'm one of the Bewitched Bookworms, I'm sure I can't win a copy of this book, but this interview just convinced me to get this book. Sigh, I think there's a new swoon worthy Edward on deck. I would want to interview Jericho Barrons, but I don't think he'd actually answer any questions I'd ask. But thats ok because I'd just be happy staring at him! I follow Melanie on Twitter and Facebook! I love your MC already! Thanks, Heather. Celia's interview is coming soon. You can check out my website for the time and place. Hmmm. Seem to be having reply difficulties. To Heather of the Bewitched Bookworms, glad Ward could intrigue you. I hope you enjoy the book! lol. There are a lots of stare-worthy heroes out there, aren't there. Thanks for the Twitter and FB follow! I absolutely loved getting to know you better. That was really fun. If I could read any character interview, it would be Silas Marner. Man, wouldn't that have been an interesting interview? Reluctant Necromancer? How is it that I hadn't heard of this new series before? Thanks goodness for this interview. Edward certainly made me more than a little curious about his possible romance. Missie, this comment makes me wonder why your choice was Eric and not Barrons. It seems you finally are ready to realize the truth that Barrons is mine! Thanks Brooke. Silas Marner would be a for a very interesting interview. Cool answer. Missie I'm glad the interview has made you curious. The romance is… we'll, I think Ward says it best "complicated." Good question, Heather. I've always wondered about the "if you knew then what you know now" conundrum. Certainly different choices might be made, but the outcome would also be different. Harry did end up with a happy ending. If he did things differently would it still be happy? Perhaps happier? Or maybe not? I absolutely LOVE this interview! And the book blurb is hilarious. I'm defintiely adding this one to my TBR pile! As for a fictional character interview, hmm…. Maybe Holden Caufield, just so I could give him a hug. Or Luna Lovegood because she seems like an awesome person to talk to, even if you only understand half of what she's talking about. Sherlock Holmes and find out more about how he thinks and comes up with his solutions. Thanks, Lori. I'm with you on Luna. She completely fascinates me. I haven't read Incarceron, but it looks cool. I'll have to add it to my TBR pile. Thanks, Jule. Good answer, Donnas. I've always wondered how Sherlock's mind works, too. 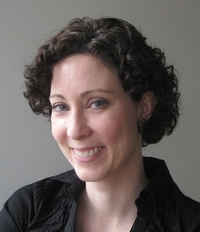 I would want to ask Juliet … seriously girl? Why didn't you check him first. This sounds like a great book.I would interview Elena Michaels and ask her some questions about how she'd tell her kids what they are and what direction she would take the pack in. Thanks, Tina. The interview was sooo much fun! Glad you enjoyed it. The talk with her kids would be one interesting conversation, wouldn't it. Nice answer! lol. I'd certainly be up for interviewing Mr. Darcy!